Oh, today started so very well. We were expecting an easy(ish) 20 km hike and right outside the albergue the arrows indicated we cross the road and we were immediately in stunningly beautiful countryside, albeit on a very steep gradient. We wound our way along a very narrow path and my boots and trousers became soaked from the plants that brushed against them. 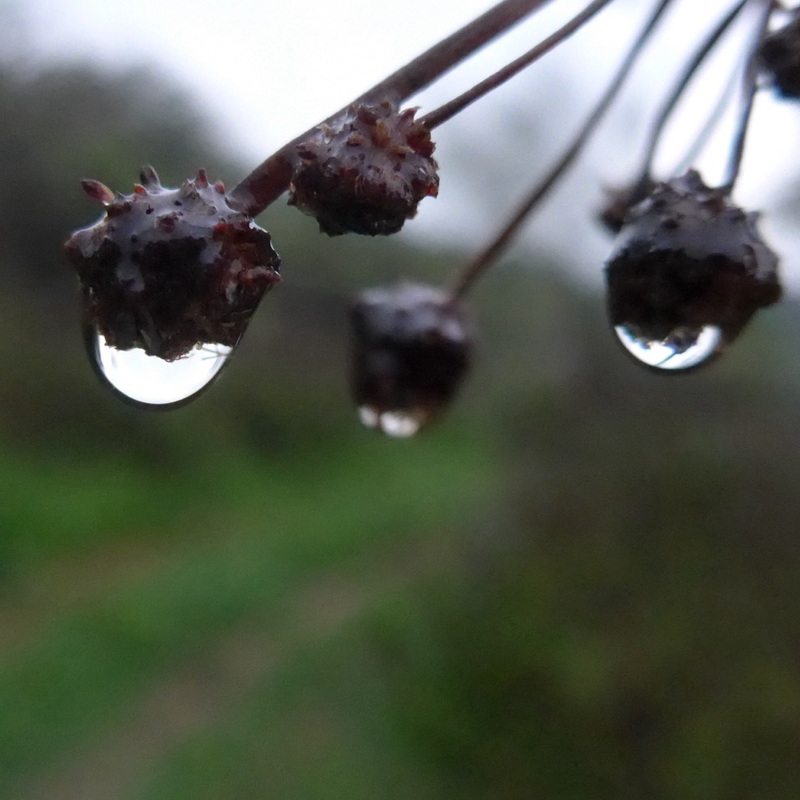 It had rained during the night and everything around was clothed in raindrops. The sky was still the same grey as yesterday but there was not a breath of wind in the air. And whilst I walked I heard my first cuckoo of the year. 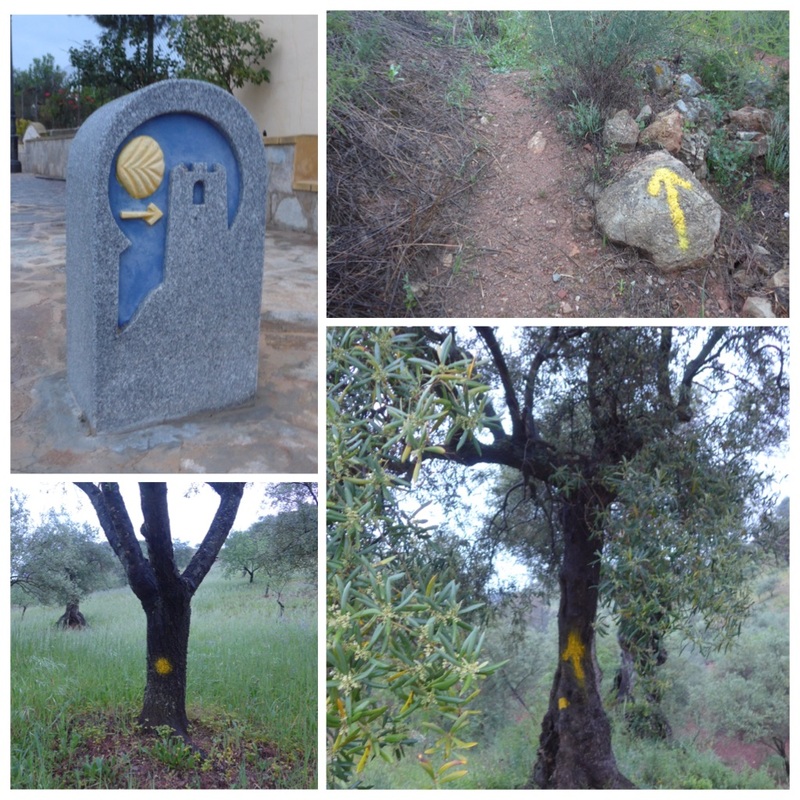 We trekked through olive and almond groves, up hill and down dale, and eventually the path opened up as we walked along a ridge. I found it hard going this morning, entirely due to the ascent but even though it was a grey day, the scenery was enchanting. 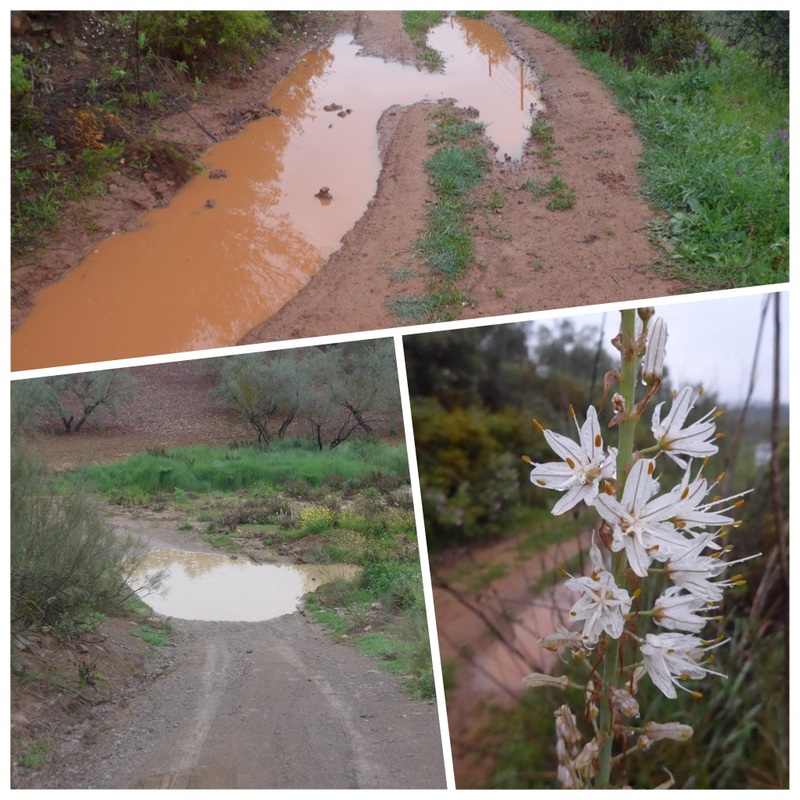 It had obviously rained more in the areas further away from Almogía as we started to come across deep puddles spanning the track. There were several tricky diversions to be made and at one point where it was not possible to divert we had to do a hop, skip and a jump. Apart from crossing one road, the path remained in deep countryside for about 17 km with nowhere to rest other than the occasional big rock, and of course no opportunity for a warm drink or a snack. Luckily George had gone to a cafe for breakfast whilst I packed in a leisurely fashion. I am not good at a quick start. The French guy had been up and out at 06:30, flashing his headlamp in all directions in the process. I don’t tend to do breakfast on the camino and I had a supply of almonds that I picked at from time to time during the day – in fact it is now almost 5pm and I have still only eaten a handful of almonds. Time to find some supper and a glass of vino in a while. After about 10 or 12 kilometres we came to a decidedly different area. The countryside suddenly opened up to huge crop fields – an amazing contrast to the scrubby landscape we had passed through so far. But with the change of scene came a change of earth and we found ourselves walking in mud. Now this wasn’t the sloppy sort of mud that toddlers like to jump in, this was the sort of stuff you make statues out of – thick and dense and extremely heavy. Our boots were soon plastered in the stuff. I thought that there was only so much mud that could stick to a pair of boots but sadly I was wrong. It kept on building up until the weight was really hard to manage. 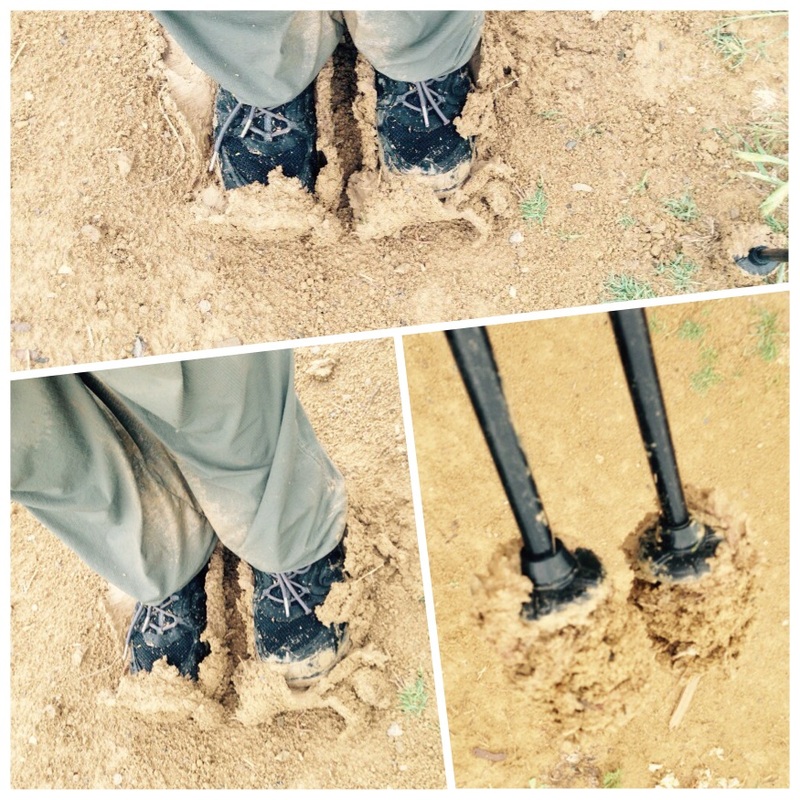 My super-light boots must have weighed about five kilos a piece and the mud even clinged to the tips of my walking poles forming great balls of clay on the ends that must have weighed over a kilo each. And of course with the build up of mud came a lack of traction so that for every difficult step uphill there was a certainty that several inches would be lost as I slid back down. Going down hill was a little easier but slightly more treacherous. It was like wearing gravity-inducing moon boots and swinging a shot-put at the same time. Every now and then the weight became so heavy that it was necessary to make the effort to flick my foot out to try and dislodge a few clods – I felt it was a bit like doing the conga – but in slow motion and not nearly as much fun! We WILL laugh about this at some time, but probably not today. After about two hours of this extremely slow progress up some very steep slippy hills we finally came to the road that led to our destination, and never were two pilgrims happier to be walking on asphalt. I found a cleanish puddle and tried to wash off some of the mud, but this was done more efficiently by wiping my feet in some wild plants by the side of the road. I did quite a good job, although my boots still looked as though they belonged on a farm. 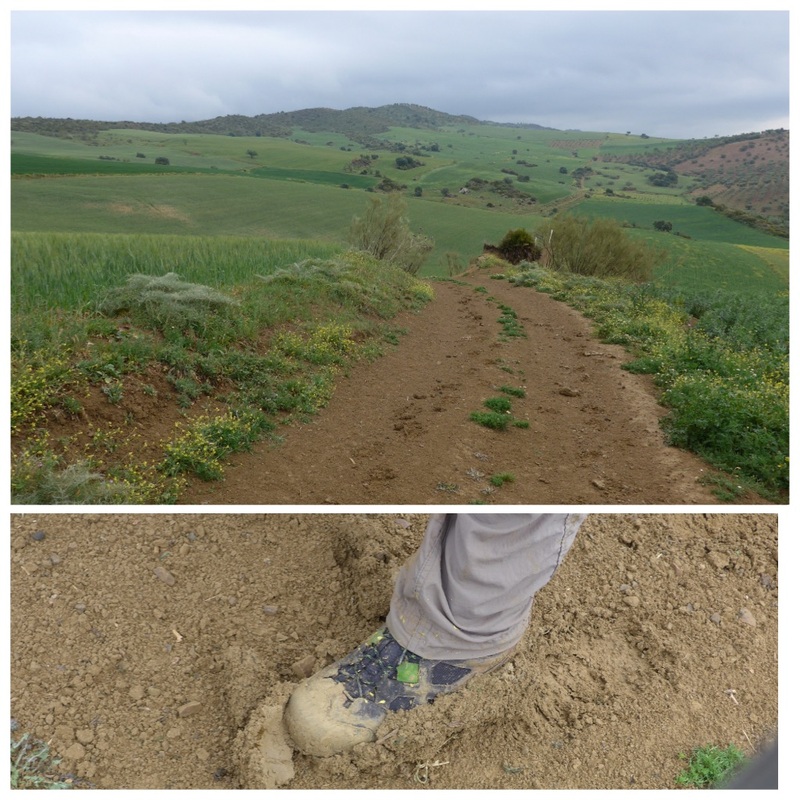 But I hadn’t reckoned the the kind-hearted amigos of the camino Mozárabe who were keen to take us back off the road as soon as possible – back onto another muddy track! Bless them. In dry weather this would have been an absolute pleasure to walk, but we were both totally exhausted with the effort it took to lift up our clay-caked feet. We reached Villanueva de la Concepción at around 14:30 and I phoned the number given for the albergue hosts and was informed that the key would be in the house opposite the albergue, which indeed it was, and was handed to us by a kind and friendly señora. 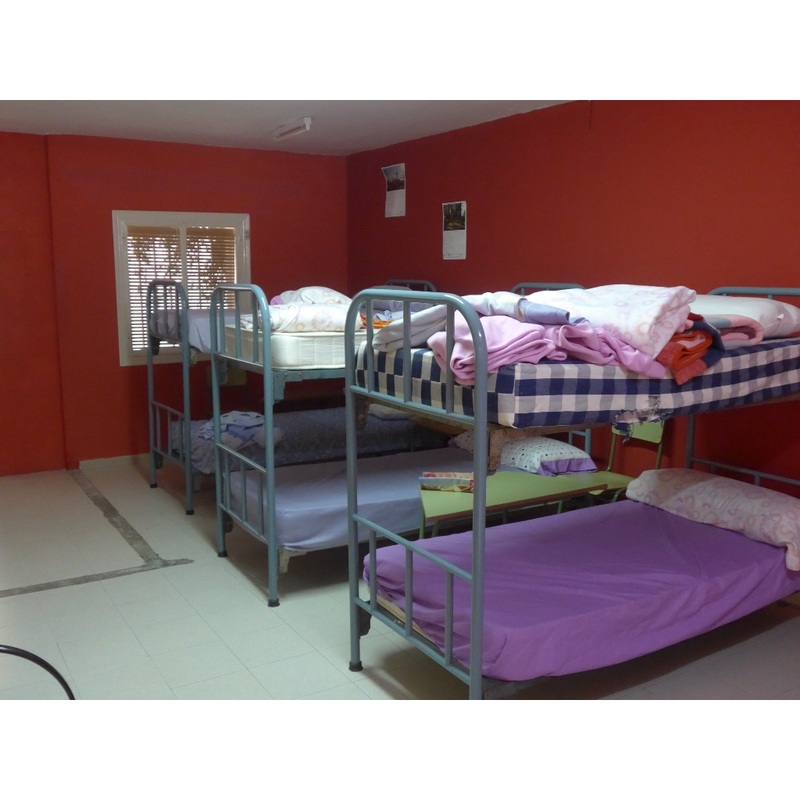 There are four bunk beds, two bathrooms, a kitchen and a large reception room. George found hot water for his shower but I wasn’t so lucky, so washed the mud off my legs and did a spit and a polish for the rest – you won’t find me taking a cold shower. Again it is a donativo albergue and as yesterday there is a rubber stamp for our credencials and a registration form for us to complete. I am very surprised to see from the forms in the folder the number of pilgrims passing through, lots of French and Spanish. Pilgrims are very well catered for so far on this camino and the signage could not possibly be better. Let’s see what tomorrow brings….hopefully a little sunshine and dry tracks! So an average of 20.6 very difficult kilometres. 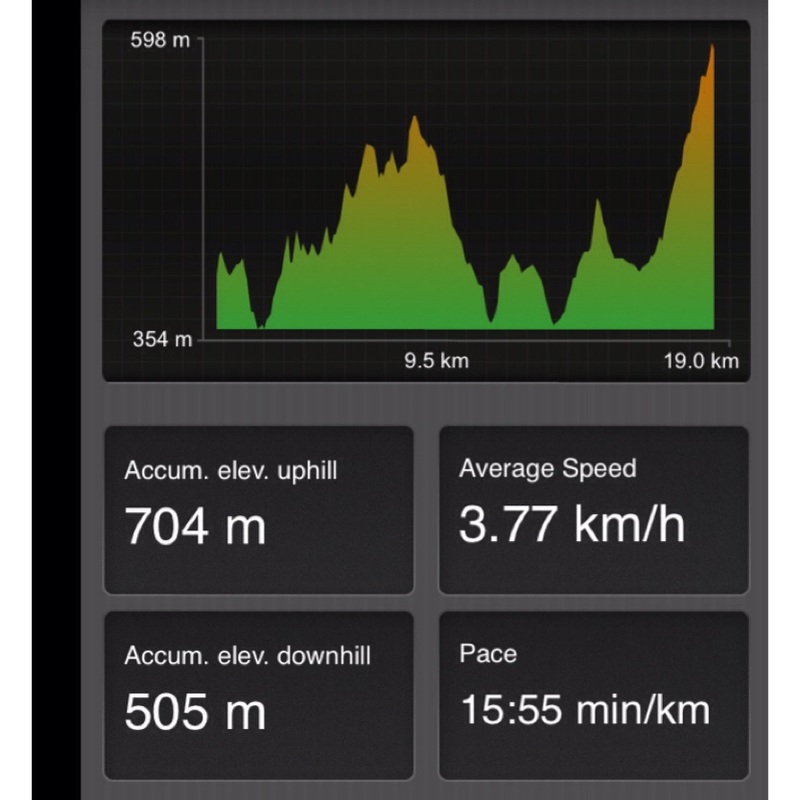 Once again, the image below shows the pace of the person who recorded it. No wifi in albergues or bars so far. Last night my mifi unit worked, but not tonight. But also couldn’t connect by phone to David, so I guess this village is a bit of a black spot. So this post will have to wait until I find a connection. Also of interest to my local friends – we are very close to El Torcal, so you can appreciate how much we’ve been climbing from Málaga! This entry was posted in Camino de Santiago de Compostela, Camino Mozarabe and tagged caminito blog, Camino de Santiago blog, Camino de Santiago de compostela, Camino de Santiago., camino Mozarabe, travel. Bookmark the permalink. Buen camino, and I hope the sun is shining today for you…looking forward to reading about Day 3. And thanks for including the expenditures. It will help me plan Camino del Norte. It’s a bit scary including the expenses, I’d rather not know. However frugally I walk my camino, it will add up to an awful lot over 45+ days. The costs add up way too quickly! Your stamina is amazing, clay packed boots and all! Just think of the calories burned. Thanks for your post, your photography is beautiful and your description of the trek touches my soul. That mud was CRAZY! Maybe you need like a snowshoe or something. Ha. Hope your next day was mud free! Take a pic of your walking companion. So, we can see what he looks like. Where is he from? Will miss you Jan, but looking forward to seeing you again later in the year. I’ve walked in mud like that. no fun! Poor you with no warm shower at the end of a really hard day. Here’s hoping for drier paths tomorrow. As per usual,am enjoying your blog immensely. Thankyou for taking the time to share with us all. May you be enriched by this camino and all that it gives you. Another walker. Soz, have to ask. India Rose and Marcus’s parents? Hi, pls don’t moderate this through but I have no way of contacting you via another route. I have a strange feeling martin and beth are the parents of two children I knew who were killed near Guadiaro in a car crash in 1992 with my best friend, Suzie. Not seen them since the funerals, as I returned to UK for 20 years, so finding them here on your blog is very odd. Especially as I am staying near Guadiaro right now to do the caminito del rey because of you!! Coinkydink or wot? Happy walking, love your blog and pics. Thanks. I thought my 2 hours pulling weeds in the garden was enough for one day, well done you! Thank you for your posts. You are an inspiration! May sun and a dry trail be your tomorrow, Magwood! Not quit – but it was today (day 5). Thanks. Love this post! You’re talking to an Essex girl here and we know ALL about that kind of mud. Anybody who’s done a day’s beagling in my part of the world will know what tons of clay sticking to the boots feels like. Not to mention its ability to work it’s way up the inside leg to parts unimaginable. How does the song go? “Mud, glorious mud. Nothing quite like it for cooling the blood.” Though I think that was referring to a hippo’s sunset ablutions in South Africa rather than a grey day in the Axarquia. You get five stars for perseverance, Maggie. That was a tough one. Looking forward to reading your thoughts on Antequera. On brief acquaintenance I loved the place. David’s here for Cottage Pie so I’d better go heave it out of the oven. But loved your blog so much had to sneak away to fire off an instant response. A putty knife, as is used in the building trade, can be useful to scrape off all the hard mud. I am not joking. We had to use it recently after a very muddy walk in the Netherlands. Meanwhile, I wish you good luck and dry weather. I’ve got a pen knife with me, but not a putty knife! Maybe something for the next camino packing list? you are a tough coockie! 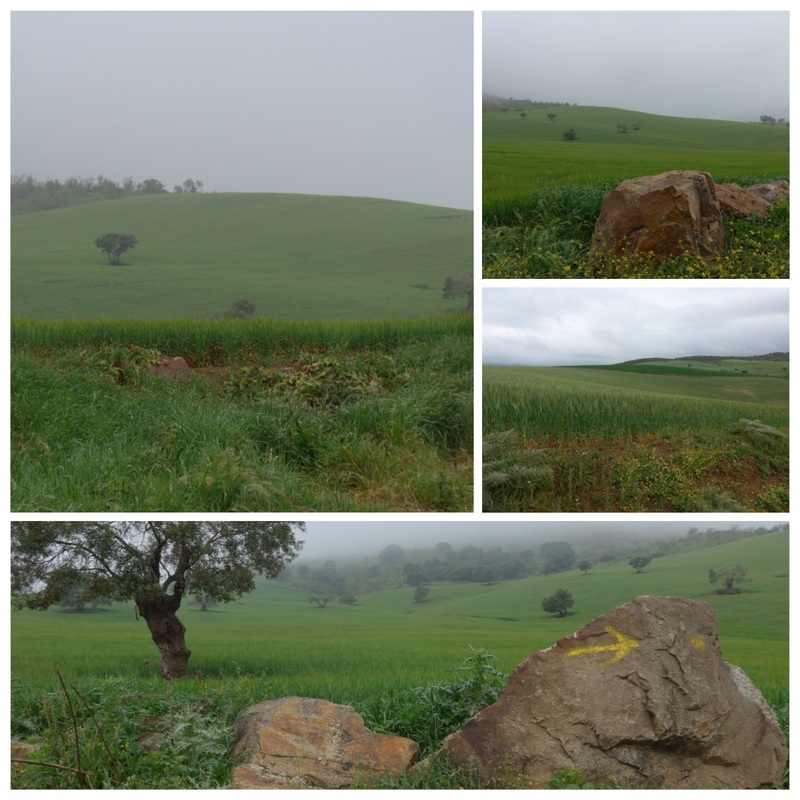 Your third great Camino blog, I’m really looking forward to following your progress. You have a wonderful way with words and I love your photos. Even your description of a hard, muddy slog makes great reading. How on earth do you manage to find the energy to write in the evenings? Thank you very much for letting us be part of your camino. It’s certainly a discipline Lucy and can be very frustrating with ‘iffy’ wifi. Very poor coverage so far on this camino. Thanks for your encouragement – it really does make it worthwhile! Wow tough day. Mud, no food, no coffee, and cold showers. But satisfaction would compensate and just being on Camino. Envy your stamina and will. I experienced that horrible mud too. Since then I have only encountered it once more on the Camino Aragones. The worst bit is the lack of traction. Accommodation for me was on the floor in the swimming centre. Incredible Maggie!! How you do all this on so little nourishment is beyond me! I’d also like to add my thanks for providing your expenses!! Very helpful! May the sun shine on you tomorrow!! It’s a bit scary keeping track of the costs – I haven’t done it before – a little a day adds up to an awful lot over a long time. But maybe not too much more than I would be spending at home!